Have you even noticed how children, even infants, are automatically drawn to music? They instantly respond with energetic movement, dance, and even join in song! Why is this? The answer: music is activating both the left and right hemispheres of your child’s brain. Research indicates that we are not only left or right brain thinkers, but both sides of our brains need to be engaged at the same time to create the best outcomes. Music not only hold words, a left-brain concept, but also rhythm and melody which are right brain concepts. VOILÁ!! MUSIC is a SUPER FOOD!! When your child responds to music, she is busy thinking, moving, playing and LEARNING through this joy-filled musical experiences! Music is a “Super Food” way to live, love and learn because it holds the powerful element of PLAY. Active music making feels and looks like play to you child. She will stay at a music activity longer because it feels like play. I mean, how many times have you heard “Sing it again Mommy!” or “More Mommy More! !” Joyful music play causes the child to thirst for MORE therefore, essential early skills are being developed through this joyful musical play. Play is the child’s “work.” It is how she learns. “Listening is the most important skill our children need to be successful in school. Children are coming to school without this skill,” states E. Cunningham Ph. D in her book Book Smart: How to Support and Develop a Motivated and Successful Reader. My first reaction to this statement was, “Oh My! This is rather disturbing! What are we going to do? Answer: Give our children MUSIC a “Super Food.” But, you ask, “How is music going to teach my child how to listen?” Glad you asked! Answer: Music is First a Listening Art!! Music holds the wonderful element of PLAY that causes the child to thirst to listen. The music ‘begs” the child to listen because he wants to play the games, sing the song and be a part of the fun. The child must listen to do this. He must listen to sing, move, play, and relate to others. What to do at home? Add the “Super Food” of Music to everything you do at home. Build your song and music repertoire by participating in a Parent/Child music class in your community. Go to your public library and check out high quality children’s literature that is based on Song. Instead of reading the book, SING the book!! Sing songs you remember from your childhood. Make-up your own songs. Sing about putting toys away, making dinner, going to bed, counting stairs up and down. Put on some good music and dance or play rhythm instruments with your child. Learning how to speak, read and write are not simple or easy tasks!! But, MUSIC can be a “Super Food” that nurtures these skills for your child. Studies at Northwestern University found that the following five skills trigger language acquisition: “phonological awareness, speech-in-noise perception, rhythm perception, auditory working memory and the ability to learn sound patterns. Their research revealed that children who received music training along with reading training performed much better than those who received other forms of non-musical stimulation, such as painting or other visual arts. Each of the 5 skills were exercised and strengthened by music!!! What to do at home? Sing the Alphabet Song and songs that teach letter sounds. (Ask your preschool teachers…they’ll have a list!!!) 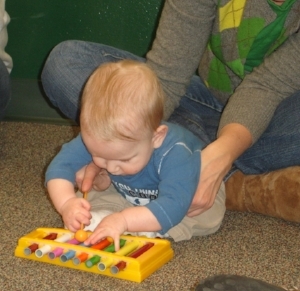 Teach your child finger plays because the finger motions correspond with the words being spoken! Play rhythm instruments. Begin by tapping the steady beat (the heart-beat of the song) then progress to playing the rhythm (“the way the words go.”) Sing traditional folk songs and nursery rhymes with your child because the words of the “folk songs” follow the rhythmic patterns of our spoken language. Teach your little one tongue twisters and enjoy the laughter!!! What to do at home? Instead of “telling” your child to “put your books away,” SING “Books away, books away. Time to put your books away!” Did you know that children listen better if we sing instead of talk! Amazing!! I remember my own stressful Mommy days and how the joy of music and singing turned our day around, from stress and gloom to calm and giggles. Enroll in a Parent/Child Music Class where your child will be surrounded by other children. You will find that “something special happens between people who share music together!” Life long bonds are formed between not only the children but also the parents! Empathy, emotions and social interaction are modeled and learned in this play-filled musical environment! Music is meant to be shared with others!! Making music together is a social event!! Music is a “Super Food” towards social development! Marching to and keeping the steady beat is not only for the marching band! It’s for “readers” too! Keep the beat help me be a better reader? Yep! That’s what I said! Northwestern University studies suggests that “moving in time to a steady beat is closely linked to better language skills. “We know that moving to a steady beat is a fundamental skill not only for music performance but one that has been linked to language and reading skills,” states Dr. Nina Krause. What to do at home? Clap your hands, stomp your feet, tap your head, wave your arms, tap your foot, nod your head, jump up high, twist side to side as you sing some of your child’s favorite songs. Get out your pots and pans and make a “kitchen band!” Put on some fast-paced marching music and march around the house playing your “kitchen drum! !” Purchase high quality rhythm instruments for your child to explore. Encourage the child to tap “big big big big” on his instrument while the music plays or as you sing together!! Clap the steady beat while you say nursery rhymes or tongue twisters. Mrs. Jo’s Favorite Books for “Super Food” Music! Both of these publications come with a delightful CD so you can learn the music along with your child!! Trust me! You’ll be humming many of these songs before you know it!! May your parenting be filled with joy and music as you share, explore and integrated “Music, a “Super Food” into your child’s daily diet. SHARE this article with a friend and LEAVE A COMMENT about HOW this article WAS HELPFUL for you at http://www.wejoysing.com/contact/ or on our Facebook page and receive $5.00 off WeJoySing enrollment. DON'T GIVE UP!! Patience is the Key!! Look at those eyes!! What's going through this little one's thoughts??!! Have you ever been at the end of your rope? Has your little one's behavior made you want to leave WJS class early, or not attend class at all? Read on for a story that lets you know you're not alone. At the start of my classes this session, I met a wonderful family at Arts in the Alley. They enjoyed playing with the instruments and discussing how our WJS classes are structured for fun and fostering all of the skills that our little ones are developing. Mom and dad understand how an early childhood class like WJS can ignite the desire for joyful learning, for years to come. The dad was super excited to bring his son to WJS, as music is a huge part of his family's lives. Rhythm Sticks SAVE THE DAY!! Dad and son came to their first 2 - 3 year old's class, where the little guy proceeded to joyfully "squeal" and run around non-stop for the first part of class. Dad felt bad and tried everything to help his son to calm himself, but he just couldn't keep his excitement contained! After dad took his son out in the hall and he still couldn't calm himself, dad was about ready to give up and take him home. Luckily, right at that moment, I was ready to pass out rhythm sticks. I popped my head out and told the little guy that Jack and Jill needed help getting up the hill, and we were going to help them with our sticks, and could he pleeeease help us? He said yes, and bounded back into class. I could see the look on dad's face, of "ok, we'll give this one more try" and he followed his little guy in, where he participated joyfully for the rest of class. He still squealed and ran around some, and he also focused and joined in too! Dad didn't give up and now we play our Sticks at home! After class, dad and I talked about how it gets better each week. I assured dad that all the parents have "been there" and most of the children didn't start out sitting and participating right away. Many are observers, some have to be moving constantly....every child learns differently. Because dad was patient and didn't give up that first class, I am so happy to report, as you can see in the picture, that dad and son have continued playing in my class, and are even playing "Jack and Jill" at home with their own sticks!! The message here? "Don't give up!! Mom of two cherished children, wife to wonderful hubby. WeJoySing instructor, graduate of OSU, teacher of children and teen drama classes at LTOB. Loves to act, sing and coach sports with her children!